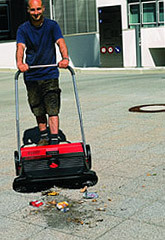 All Haaga sweeper models have adjustable brushes. Turn the knob and the brush level changes to accommodate all kinds of surfaces, from concrete and asphalt to low carpet and smooth interior flooring! Haaga 250, for home use, best for smaller indoor areas or light outdoor home use (=1.000 sm/h). Haaga 255, for indoor and outdoor use, cleans an area of 3 soccer fields per hour (=1.600 sm/h). The "two in opposite directions" rotating circular brooms grab the material directly in front of the machine and whisk it into the container positioned directly behind the brooms. The machine does not simply drive over the material and push it away. All kind of materials, even wet and dry leaves, stones, flat or large materials will be whisked into the machine. Unlike other manual sweepers, there's no center wheel or rubber lip to get in the way of cleanup. The side brooms pull dirt from corners and crevices, getting it off the street and into the garbage, where it belongs. Even leaves, cans, cups, large debris, sand and stone are whisked away by the TopSweep powerful brushes . They make quick work of driveways, sidewalks, walkways, porches, terraces, and garages. They are also suitable for cleaning commercial carpets and walkways, like those found in movie theaters or hotels. The secret of professional cleaners, movie theaters, and hotels. This is how the pros do such a quick and thorough cleanup without sweat and effort... they just push and clean. The Haaga easily picks up cans, paper, nails, broken glass, wet or dry, big or small. Extremely easy to use, to push, carry, and store. Can be used on concrete, tile, rugs, and pavement etc. Ideal for home and business. for driveways, walkways, storefronts, patios, garages, poolside, movie theaters. Save your back. Just walk and easily push dirt and debris away. No more bending	over	to pick up	large debris. Protect your eyes and lungs from dust and mold. Haaga's patented 2 brush design sends the material into the hopper, not your body for dust-free sweeping. Protruding polyamide disc brushes on both sides rotate inwards depositing debris into the large built-in bin. Works on all surfaces : the height of the broom is continually adjustable so as to ensure optimal distance from the ground. Works on wet or dry debris. Wear-resistant, Belt-free direct drive means no need to replace costly belts, as is the case with other brands of push sweepers. Empties easily : removable latched container can be taken off, emptied and refastened with a sweep of one hand. Space saving: stores or suspends compactly in storage in order to save space. The Haaga you choose will depend upon your sweeping area. Professionals should consider the 400 or 600 Series Sweepers. Hopper size 25 liters. Perfect for personal use. 25 liters. Perfect for personal use. Suitable for Suitable for street dirt, leaves, small garbage, dry or wet. Best for household use. Suitable for leaves and big debris. To pick up fine sand, go over the area twice. Best for indoor and outdoor use. The Haaga 250 and Haaga 255 include a 4 year wear and tear warranty on the brooms, and a 2 year guarantee on all other parts.